How much hair is collected for a hair drug test? Does your employer or potential employer require a hair drug test? Are you worried too much hair will be collected and it will look like a weird haircut or even a bald spot? We understand these worries as rumors abound about exactly how much hair is needed for a hair drug test, especially if you are bald or have a beautiful head of hair. But, for best-in-class testing sites and professional collectors like CleanFleet, the opposite is true. At drug test collection sites like ours, the collector will only cut a small, specific amount of hair needed for the laboratory to perform the test. Hair testing is the only drug testing method available that provides a 90-day drug use history window (urine drug testing has a 2-3 day window). When compared with urine testing, hair testing provides nearly twice the number of positives due to its longer detection time-frame. This makes hair testing an ideal solution for a number of drug testing programs, such as pre-employment testing. So, how much hair is actually needed for a drug test? Hair testing requires a small sample of hair, about 100-120 strands of hair (around 100 milligrams made up of the first 1-½ inches from the root), that is collected under direct supervision without any invasion of privacy. The hair is cut as close to the scalp as possible, so only the strands of hair above the scalp are tested and not the actual hair follicle. Typically, hair is cut from the crown of the back of the head in a manner where it will not be as noticeable. If the donor has no head hair or hair shorter than ½ inch long, the collector can use hair “from top-down” that includes facial hair, chest, underarm, leg, etc. According to Quest Laboratories, since the weight of hair varies by individual and because drug testing collectors do not have access to highly sensitive weighing scales, it is easier to visualize the required quantity in terms of the width or diameter of the hair specimen collected. If the hair is more than four inches long, the laboratory requires approximately 120 strands, or the width of a pencil (or a normal cotton ball size if curly hair). If the collected hair is shorter than four inches, but longer than a ½ inch, additional strands of hair (in addition to the first 120 strands), may be required to complete testing. The collector should always note the source of the hair sample on the hair collection envelope. If body hair is collected, the collector must make sure to collect as much hair as possible. Body hair is usually lighter in weight and more hair is needed for testing, according to Quest Laboratories. 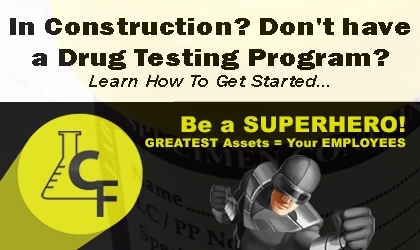 Learn why your company should have a drug test program. There are 7 comments. on "How much hair is collected for a hair drug test?" If I haven’t used Heroin In 80 days and no other drugs and only have 1 1/3 hair can I pass a drug test. The rate at which heroin leaves the body, of course, affects how long it will take before the substance is no longer detectable in various drug tests. The drug tests approved by the Food and Drug Administration (FDA) for heroin are those for the blood, saliva, urine, and hair follicle. Many tests look for heroin metabolites, which are agents creates when the liver metabolizes the drug. These stay in the system much longer than the actual intoxicant. Most of the time, heroin is no longer detectable in a person’s urine after just 2 days. However, certain tests have been known to have a positive result for this drug for up to 7 days. Blood and saliva tests aren’t often used for heroin due to the fact that this opioid, like many others, has such a short half-life. It can therefore take only 5-6 hours for the drug to become undetectable in these fluids, though they can possibly be found for up to 2 days. The only test that works for longer than a week is the hair follicle test, which can detect heroin for up to 3 months or more. However, there are many possible factors that can interfere with hair tests. Is 117 days enough to test negative for cocaine? We recommend asking a medical doctor or lab to better answer this question, but assuming it is a urine drug test, regardless of habitual past use or not, the test should come back negative. If it is a hair test, you could still be tested positive as hair can go back up to 24 months. Good luck! Are you still able to get caught? Hello Brian, I haven’t used cannabis for approximately two months. Is it likely I will pass a hair test at this point if I used heavily up to the point of discontinuation? I did a lab urinalysis at 3 weeks clean and was below cutoff levels. Considering testing myself prior to providing a sample to be sure, but dont want to waste my money. Thanks for any feedback. The standard detection window of a hair test is 7-90 days. That time frame is calculated on the basis of how long it takes for hair at the root to grow past the scalp, and it takes into account the part of the hair that drug testers sample. In 2016, an average of 28 people a day in the U.S. were killed in DUI accidents, according to federal estimates.